Bruce Dickinson is back with Iron Maiden and charged up to talk about the future. We met up with the Iron Maiden lead vocalist at the Parker Meridien Hotel in New York City and found someone reflective of the past, but focused on what’s to come. Dickinson re-joined the group earlier this year with a new vision. He brings to the table his experiences as a very successful solo artist. The time was right to come back to the fold with the band now recognized as the top metal group in British chart history. “That’s all well and good, but it’s rooted in the past,” is how Bruce describes how he feels about the new accolade. He is determined to create something that will draw the attention of the younger generation. His eyes brightened when he talked about the effect that Rush’s masterpiece — 2112 –had on him, and he claims that the next Maiden album will have a similar influence on future generations of kids.That’s not to say that Maiden is changing its metal style. Dickinson is convinced that Iron Maiden will make a lasting impression on everyone and will gather up tons of new fans in the process. He says that there’s a real lack of guitar-laden music today, and that the time is right for change. There will be two short tours this summer — 12 shows in North America and 12 shows in Europe — which will just be a tease of what’s to come. The tour set will be based on the soon to be released Ed Hunter enhanced CD package. Bruce says that the stage production takes up five tractor-trailers and to expect awesome visuals and graphics. The Ed Hunter CD set contains three CDs: a double album length CD of the top 20 Maiden hits as voted by the fans at the official Iron Maiden website, plus a bonus CD-Rom of the Ed Hunter game. In the game, you are Ed Hunter. You must chase Eddie through time and to the worlds depicted on every past Maiden album. The plan is to release a studio album of all new material by early 2000, followed by a full-blown world tour. Maiden now boasts an unprecedented three-guitar onslaught, which surely will intensify and enhance the music. We asked Bruce how he came to rejoin the group. He said that Blaze Bayley had left the band, and the guys asked him if he was interested in coming back. They approached Bruce first before actively pursuing a new lead vocalist. When Steve Harris brought up the idea, Bruce’s first response was “YES!” He said it felt totally natural, and he told Steve that he was in it for the long haul — if Steve and the rest of the band wasn’t serious, then the answer would be no. Bruce has already started writing new material, and looks forward to getting in the studio with the rest of the band. We also talked to Bruce about his solo work and his latest tour. He just returned from a four-city South American tour in support of his latest album, “Chemical Wedding”. He said that there were over 2,000 fans who couldn’t get in to his last show in Sao Paulo because the venue was sold out. The promoter begged Bruce to add an extra show the following day, but due to time constraints, they decided to add a matinee show instead. He was glad to do it because the fans were incredible. We asked Bruce if his approach to writing solo material differs from his writing with Maiden. Bruce said that his writing style is very different in his solo work. 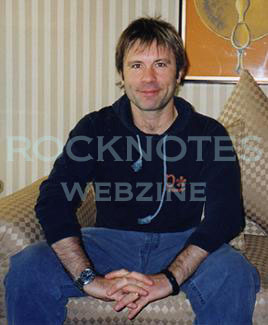 He’s able to sit down with Roy Z [producer and guitarist], a drum machine and guitar, “Roy will play guitar riffs and I’ll just write down some lyrics and come up with a song.” This is something that he’s never done with Maiden. He said that Roy Z is very versatile in that he can play many different instruments whereas in Maiden each player’s individual input is added separately. Bruce considers Chemical Wedding to be his best work to date. Last fall he wrote, “as each track was recorded it was like pieces of stained glass falling into place in a window, the light would never be the same”. If Bruce Dickinson is right about the future of Iron Maiden, the world may never look at metal the same way again.